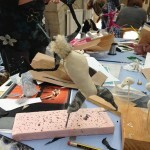 On Saturday I participated in a Samantha Bryan model making workshop at the Yorkshire Sculpture Park. 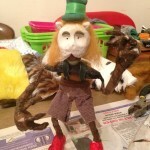 Samantha is a successful artist who makes beautiful fairy creatures out of clay and leather. I’m always trying to develop my skills as a model maker/animator so I was really looking forward to learning some new tricks. 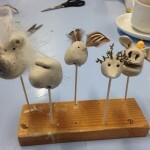 First we made a selection of simple heads from air dry clay. Samantha takes her inspiration from nature and she provided us with an assortment of natural materials like acorns, seeds and twigs. We were encouraged to use them in creative ways. 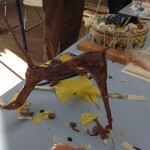 Then Samantha showed us a simple armature made from aluminium wire and asked us to create something similar. 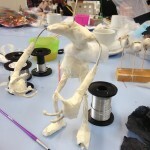 Armatures are also used in animation model making as the wire is flexible enough to move without snapping. 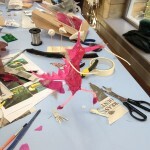 What I learned from Samantha is that anything can be used to create something else. 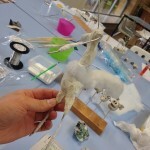 The bodies of the armatures were made out of paper, sponge, tissue, masking tape, feathers, fabric, acorns etc… Anything goes, it doesn’t have to be expensive. Try and recycle things and turn them into something new. When I teach animation I generally stick to using plasticine. It’s a brilliant materiel because it’s easy to mould, it’s flexible and holds its shape. 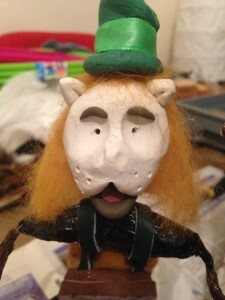 I’ve stayed away from armatures because I don’t like using wire with plasticine. 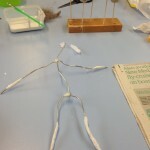 (A fear of a child squashing a clay character with their hands and forgetting about the wire inside). 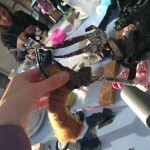 The bodies of our characters were mainly made from scrunched up newspaper and pva glue. It was so simple I was kicking myself for not doing something similar before. I’m now really excited to be able to run a workshop using the skills I’ve learned. I’ll definitely be making some paper characters with children in the future. I would recommend the course to any adult who wants to get creative in a ‘think out of the box’, ‘anything goes’ kind of way. It was really brilliant.